Don’t worry if your landscape has shaded areas. Brighten and open up the space by growing shade-loving shrubs. Grown in a wide range of sizes, shapes and blooms colors, many shade-loving shrubs produce vibrant, showy blooms that help to create an added burst of color to the garden. Some are evergreen, meaning they retain their foliage color year round and provide vibrancy to the garden. Japanese plum yew (Cephalotaxus harringtonia) is a needled evergreen coniferous shrub that thrives in full shade. It grows 5 to 10 feet tall and wide and has a spreading, arching from and slow growth rate. According to Missouri Botanical Garden, they are commonly called plum yews because the foliage resembles that of yews and the fruits on the female plants resemble small plums. The 1 1/2 inch long, linear, spirally-shaped, evergreen foliage appears along the erect stems and in a "V" pattern. The fruits on Japanese plum yews are edible. Japanese plum yews grow best in well-drained, moist and shaded areas of the garden. They tolerate shade better than most evergreen shrubs and have an excellent heat tolerance. Once Japanese plum yews become established, they also withstand some drought. Plant them in U.S. Department of Agriculture hardiness zones 6 to 9. 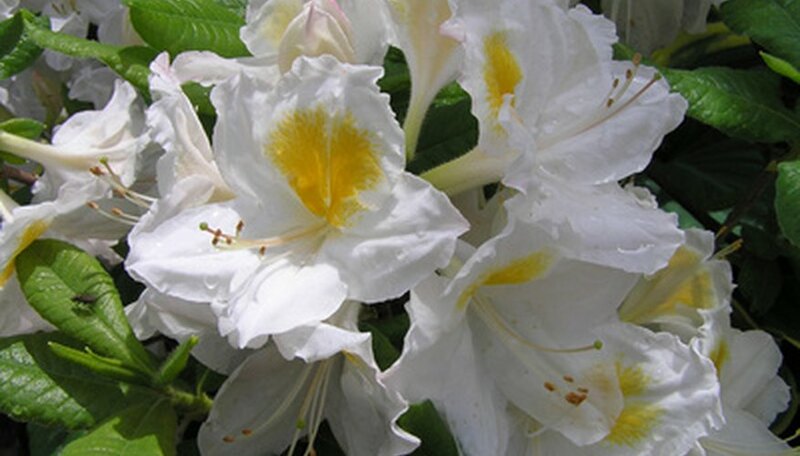 Rhododendron (Rhododendron 'Capistrano') is a broadleaf evergreen shrub with a dense, mounding from. It grows 3 to 5 feet tall and 5 to 6 feet wide. The dark green foliage on rhododendron is elliptical to oval in shape and remains with color year-round. The spring-blooming flowers on these rhododendrons appear in large tresses of yellow flowers that attract hummingbirds to the garden. Rhododendrons are attractive planted along mixed borders or grown in masses along the landscape. They grow best in full to part shade and well-drained, nutrient-rich soil that is acidic. Plant rhododendrons in USDA zones 5 to 8. Japanese laurel (Aucuba japonica) is an evergreen shrub that grows in full, dense shade. Grown for their bold foliage, Japanese laurel grows 6 to 10 feet tall and wide and has a rounded from. The oval, glossy foliage on Japanese laurel appear as if they are speckled with yellow paint for a commanding display. The spring-blooming, small red to purple flowers on Japanese laurel shrubs are followed by the bright red berries. Adaptable, Japanese laurel shrubs tolerate most soil conditions, excluding overly wet, waterlogged soils. They are suitable to grow in USDA zones 6 to 10.